From Elkins, take RT 219/250/55 south through Beverly and Dailey, at Huttonsville, keep right to stay on RT 219/55 where RT 250 goes off to the left. Near the town of Valley Head, turn right on RT 15 (set odometer) and go 3.9 miles on RT 15, just past a large quarry on the left, turn left on Valley Fork Rd, (CR 26). (As you go down this road (sometimes gravel) you will pass the Elk River Lodge where there is camping, food and other services - none other nearby here.) 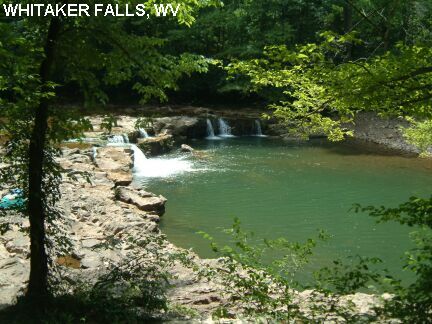 Then at 6.7 miles from RT 15, you come to Whitaker Falls, very visible from road.